To keep your feet warm on a cold winter morning, you will need to find the best-insulated slippers. What makes a pair great is, for the most part, how comfortable they are. Fit, lining, material, and practicality are also important factors to keep in mind when shopping. Whether you are looking for a gift for a man in your life or yourself, we have reviewed the best options to keep your feet cozy and warm. If you are looking for comfort, one of the best options to try out is the L.L Bean Men’s Wicked Good Moccasins. These wildly popular moccasins have been the go-to style for many people for years since they are comfortable, warm, and long-lasting. 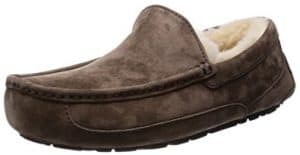 They are made of a soft sheepskin material with a shearling lining that will help to keep your feet super warm, but not sweaty (the shearling wicks moisture away from your feet). Like a lot of slippers they don’t come in half sizes, so if you are a half size make sure you order up a size. The footbed is a contoured memory-foam that is great for arch support with a durable outsole for added traction. Another top men’s style for comfort is the UGG Ascot. If you are familiar with UGGs products, you will know that they know how to do comfort, and these are no exception. They aren’t cheap, but many wearers can get five-plus years out of them and end up finding the initial cost to be worth it. The Ascot comes in water-resistant suede or leather, and are fully lined with natural wool. They don’t have a lot in the way of arch support but are still considered to be very comfortable. Some people think these are one of the most comfortable slippers ever made for men. The Ascot is also one of the warmest styles around, so you aren’t going to want to buy these for the summer or more temperate climates. Some men find the Ascot fit a little tight at first, but will stretch out and loosen up as you break them in and the liner gets compressed. The UGG website has a useful “Find Your True Fit” option that helps you figure out the best size to get, compared to other brands that you wear. 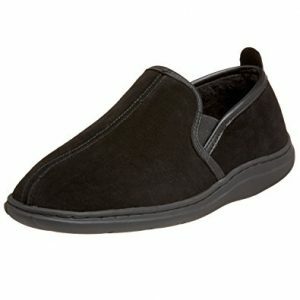 The Isotoner Microterry is a comfortable, warm, and durable slipper. They aren’t as warm as the UGGs or the L.L Bean shearling options, so they work well for the summer since they don’t get too hot. They are relatively inexpensive and easy to find everywhere. They have okay arch support and super comfy cushioned memory foam molds to your foot’s shape for a custom fit. These are the kind of style that has the foam sole that often wears out after wearing for a few years so you may not get as much wear out of them like other brands, but they are still a great option at a reasonable price. The Tamarac is an inexpensive alternative to the UGGs or the L.L Bean styles. They are suede with a dyed lamb fur lining; the lining is from China, not the Australian shearling that you find in more pricey options. It is a very warm style, so they won’t work well as a summer slipper. The Cody has a thick sole with a rubber grip design at the bottom, so you can wear it indoors or outdoors if you have to make a short trip. The footbed is memory foam, which helps make them very comfortable. For the price they are pretty good quality, that will fit most men well. These are a great option if you have a wide foot. The Sorel Falcon Ridge is a very comfortable and soft slip-on mule style. They are leather with a wool-blend lining, so they’re very warm. The bottom is a natural rubber outsole that provides pretty good traction if you have to go outside where there may be snow or ice. The sole is also more lightweight than some of the other options that have a thick rubber sole. Sorel footwear is generally pretty durable and long lasting, although some wearers have had issues with the lining shedding and making a mess, and the sole separating from the slipper. Despite some quality control issues, the majority of wearers find the Falcon Ridge to be high quality, durable and incredibly comfortable. L.B Evans is another favorite brand in the men’s slipper world. The L.B Evan’s Klondike Closed-Back is a classic style that is comfortable and long-lasting. They work exceptionally well for wider feet. This style has a sturdy rubber sole with a good grip so you can wear them outside. They are made of suede upper material with a faux fur lining. The footbed has memory foam, and the Klondike has a lightweight feel to it making them very comfortable and easy to wear. Minnetonka is a brand that has a very loyal following. They have been in business since 1946 and are known for making high quality products. 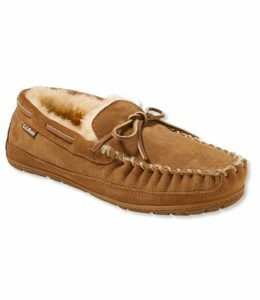 Their moccasin styles are a particular favorite of many due to their extremely soft lining. Customers also like that the hard rubber soles make them comfortable, yet still firm enough to wear if you’re out and about. Fans of this brand also love the very reasonable price for the quality that you are getting. While Minnetonka products used to be manufactured in the USA, they are now are made in the Dominican Republic. The only downside to this style is that it is pile lined. Pile is humanmade imitation lamb’s wool, so it may not wick away moisture in the same way that lamb’s wool does. As a result, some people may find this design causes feet to sweat a little more than natural wool does. Acorn Slippers are very popular and are another brand that has a strong following. People love the Acorn Moc style because they are luxurious and soft, they have a multilayered cloud cushioned foam footbed, and they come in a wonderful selection of fleece or textured upper material. The soles are rubber and have grips on the bottom to help prevent slipping. These are one of the few designs that can be machine washed if needed. The fleece lining is moisture wicking so your feet will be warm, yet shouldn’t feel hot and sweaty. Width– The width is also going to play a significant part in getting a great fit. The most common width is medium, but if you do require a wide or a narrow fit, it is well worth taking the time to get the right width for your foot rather than just settling for what may be available. If you are looking for a style for very swollen feet, some brands offer extra-wide widths with adjustable Velcro straps. Foamtreads has some good options for swollen feet in their Orthotic Medical line. Inside Outside- If you are planning on wearing your slippers outside to put out the garbage or make a quick trip to the corner store, it is useful to get a style that is considered an inside-outside design. The way you will know that the slipper is okay to wear outside is usually the type and thickness of the sole (it will be rubber and relatively thick). Sweating – If you have hot feet you may not want to go for the shearling styles as they tend to be much warmer than a fleece lined design, however, shearling does act as a natural wicking type of material so in most cases it should draw moisture away from your feet so they won’t feel as sweaty. Footbed – There are a variety of different types of footbeds that you will find in the different styles, the most popular being a memory foam or high-density foam. Some footbeds are removable and may contain an anti-bacterial treatment. Arch support– Most slippers are meant for relaxing around the house, but if you have issues with your feet, you will want something with some support. If you want a relaxing yet comfortable fit with a bit of arch support you can try the Acorn styles that have extra arch support. Haflinger and Vionic are also great brands to look for if you want an option with more of an orthopedic type feel to them. Cleaning– Slippers that are worn every day can get pretty dirty and smelly, especially if you have sweaty feet. There aren’t a lot of brands that can be thrown in the wash without causing significant damage to the structure. If you want a washable style, Isotoner and Acorn styles can be washed on gentle cycle in your machine and left to air dry. The wool wool/lamb shearling/suede options are much more difficult to clean. They can usually only be spot cleaned with a brush or damp cloth. Design– There are a lot of different design styles for men’s slippers including moccasins, closed back, boot style, clog, slide or thong. Everyone will have different preferences based on various factors. If you have narrow feet, you may not like the open heel because they may fall off. If you are buying as a gift for someone, a slip-on or open heel are great if the person you are buying for has any mobility issues. Lining- The lining of a slipper plays a significant role in how comfortable and warm a slipper will be. 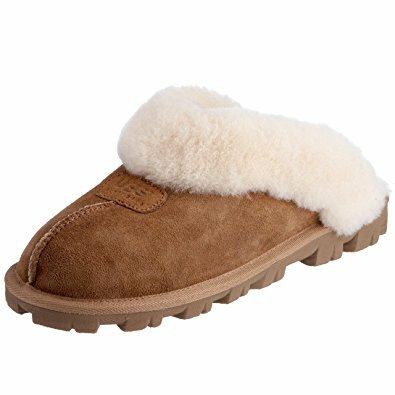 The Australian shearling that is very popular in some of the higher end slippers is a good insulator for keeping your feet warm while also drawing away moisture from your feet. 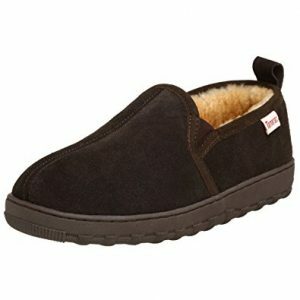 Fleece is also an excellent slipper lining to look for warmth and comfort.